Tender, buttery shortbread cookies flavored with espresso powder and mini chocolate chips. No rolling-out, just press the dough into a pan and bake! The next time someone asks me how I take my coffee, my answer is “IN a cookie.” Welcome to the world of coffee-flavored cookies, and what a beautiful world it is! We all need a little boost to get us through the last week of the Christmas season, and my new favorite way to caffeinate is ESPRESSO SHORTBREAD COOKIES! 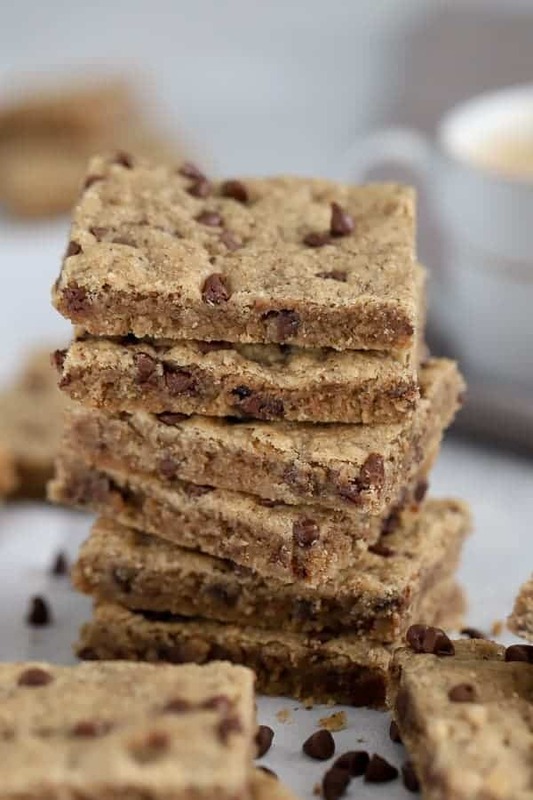 Buttery shortbread, mini chocolate chips and plenty of rich espresso powder. 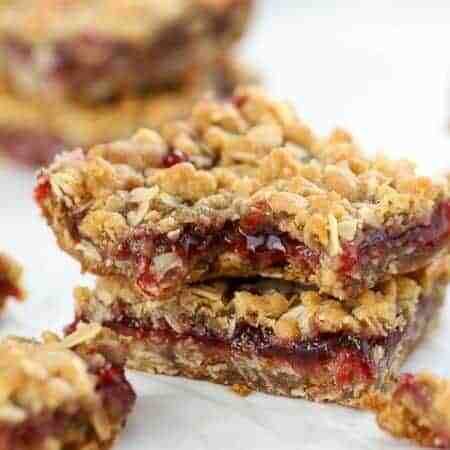 These will be the first dessert to disappear off your holiday cookie platter (especially if I’m in the room). Start by creaming butter, sugar, espresso powder, and vanilla extract. This is a great time to pull out that stand mixer, let it mix for 3-4 minutes. Add flour and salt and give it a mix. 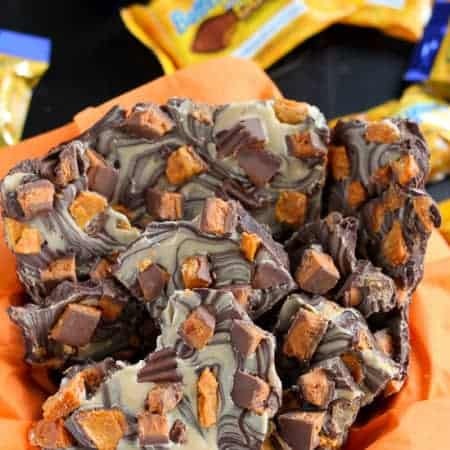 Add mini chocolate chips and give it one last mix. 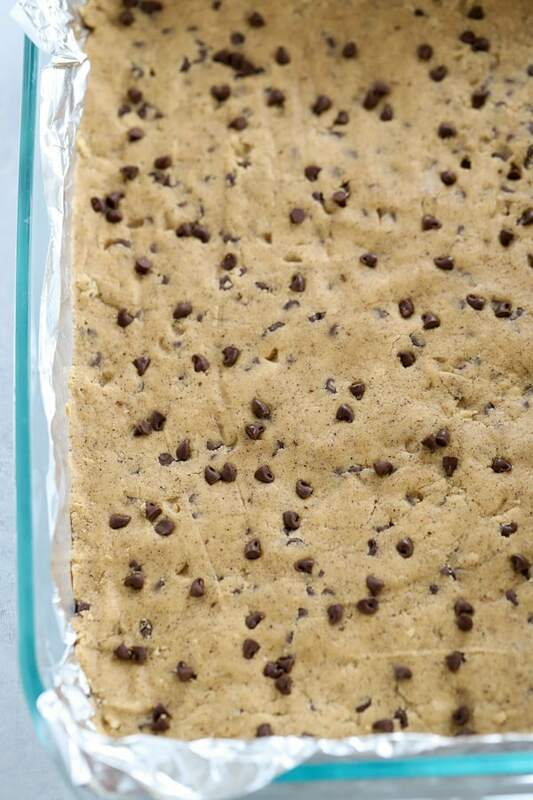 Dump the mixture into a foil lined, 9×13 baking pan. Press it into a flat layer, prick the top (to let steam escape), and BAKE! When the shortbread comes out of the oven, carefully cut it into your desired shapes (right there in the pan), then leave it in the pan and let it cool completely. I love, love, love that this shortbread cookie recipe does not need to be rolled out. The dough is pressed into a pan and baked. Cutting the shortbread when it is hot and soft, straight out of the oven, ensures that you will have perfectly cut cookies once the shortbread cools and firms up. I like to think of these as a grown-up cookie. They are not overly sweet and the espresso flavor definitely comes through. They are fantastic alongside a cup of coffee or a glass of milk. Although I usually love over the top desserts, I absolutely adored these simple shortbread cookies (so much so that I had to make a second batch for gift giving because I ate most of the first. Whoops). If you want to dip or drizzle these cookies in melted chocolate, you absolutely can. I planned to do just that, but honestly, I was really happy with texture and flavor exactly as they are. They aren’t the prettiest cookie, so if you’re looking to bump up the visual appeal, a dip or drizzle of melted chocolate will do just that. 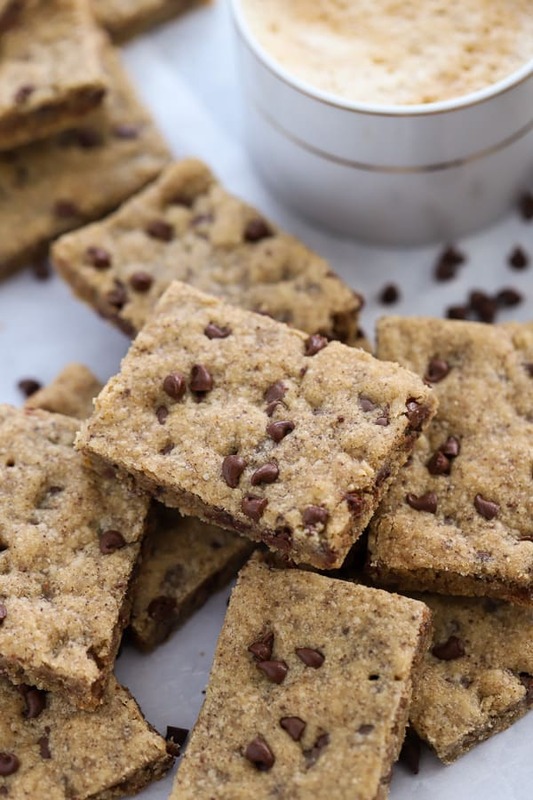 Tender, buttery shortbread cookies flavored with espresso powder and mini chocolate chips. Preheat oven to 325°F. Line a 9x13 baking pan with foil and grease the foil. 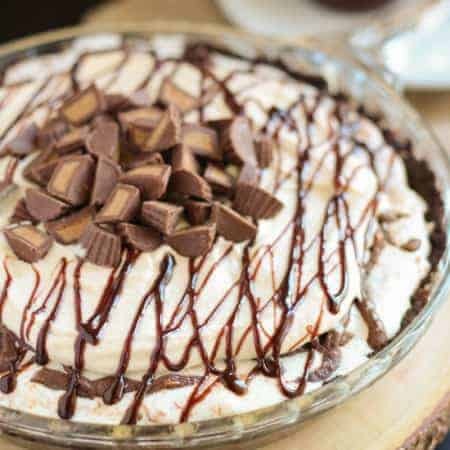 Using a hand mixer fitted with the paddle attachment, beat butter, granulated sugar, vanilla, and espresso powder for 3-4 minutes, until fluffy and creamy. Scrape down the sides of the bowl as necessary. 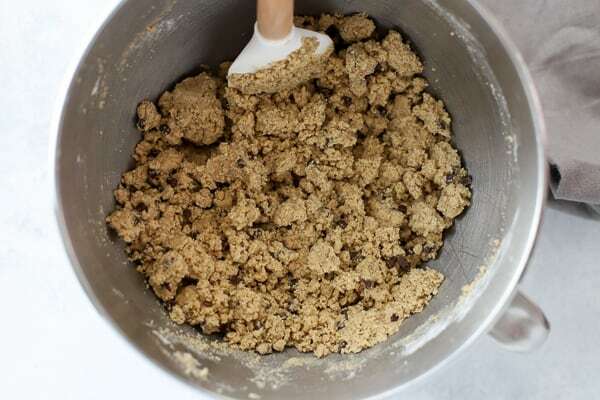 Add flour and salt and mix until just combined, Add chocolate chips and mix until evenly distributed - the mixture will be crumbly. Dump the dough into prepared pan and press it into an even layer. If the dough is sticking to your hands, wet your hands slightly and it should pat down easily. Prick the dough with a fork in a few places (to allow steam to escape). Bake for 20-25 minutes. Place the pan on a cooling rack and immediately, cut the shortbread into the shapes that you want your cookies (cut it right there in the pan). Leave the pan on the cooling rack to cool completely before removing the cookies. Yum! I love the flavor combination here. And the fact that you don’t have to roll them out is even better! Oh heck yes! 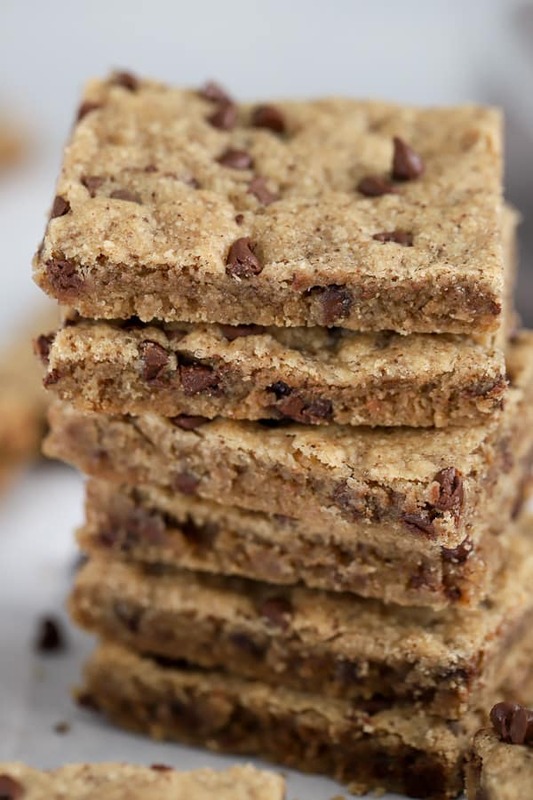 Three of my favorite things in one recipe -chocolate chips, espresso and simplicity! 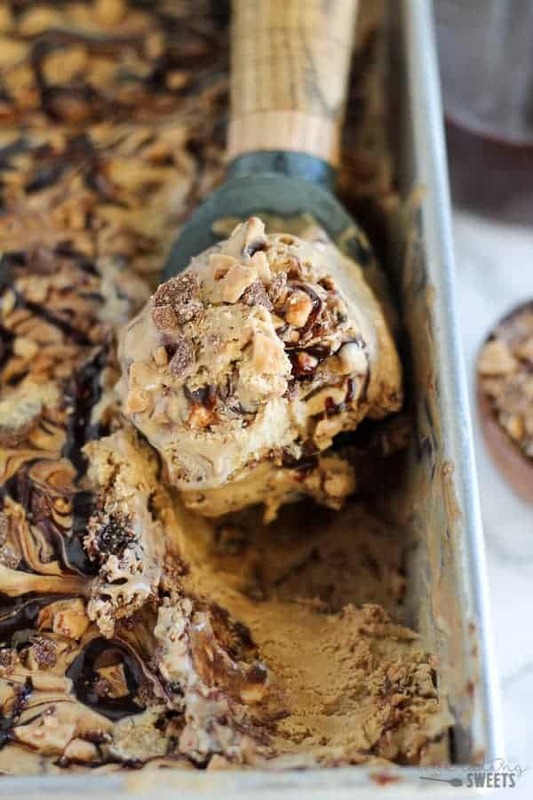 You’re really speaking my language with these cookie bars! 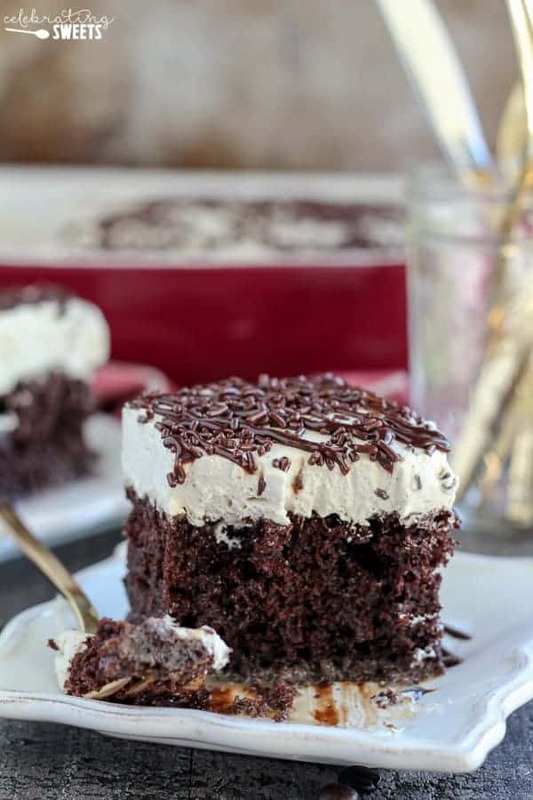 I was sold at “espresso!” This recipe is so, so good! 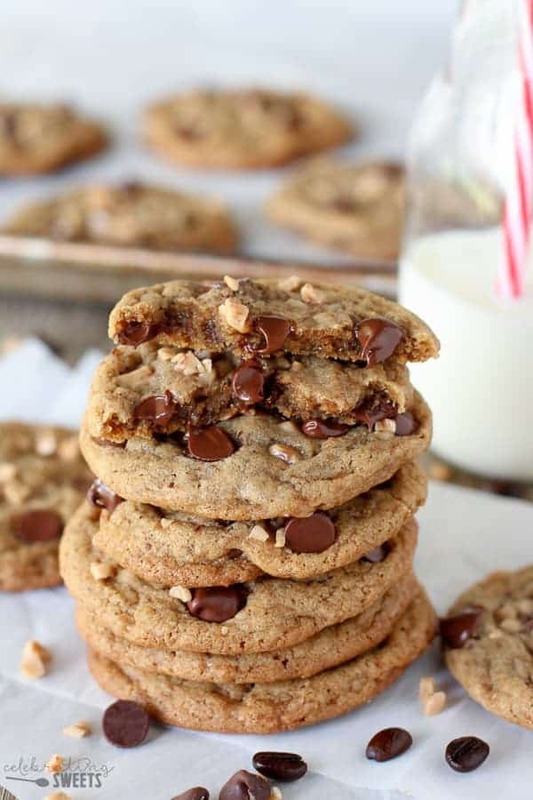 I love the idea of adding coffee to cookies. Yes please… And the perfect way to start the day! Expresso shortbread cookies? Count me in! 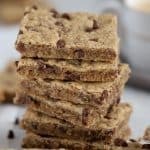 These espresso shortbread cookies are my new favorite! My dad would love these cookies.